Once discharged, Walker returned to school, got his degree in arts and sciences, and started a panel cartoon about a lazy college student for the Saturday Evening Post. In 1950 he expanded that to a multi-panel strip, but that strip struggled, even though it was bought by King Features’ top boss: William Randolph Hearst. In 1953, with the Korean War gearing up, Walker had his lazy student join the Army. 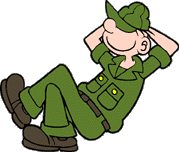 The Army didn’t like the strip: Beetle Bailey was about a lazy soldier who didn’t respect officers, and it was banned from the military newspaper, Stars and Stripes, for a decade. That story was so delicious that King Features ensured it got huge publicity, which assured the strip’s success. The military paper banned Beetle again in 1970, when Walker dared to introduce a new recurring black character — as an officer, no less! But Lt. Flap proved to be very popular, and the second ban boosted circulation again; even as late as 2013, the strip was syndicated to 1,800 newspapers in 52 countries. Walker drew the strip for 68 years, making it the longest ever any comic strip was drawn by its original creator. That would be enough for any career, but in 1954 Walker introduced Beetle’s sister, Lois — and Hi and Lois debuted as a separate strip, written by Walker and illustrated by Dik Browne (who later went on to create his own popular strip, Hägar the Horrible). With the two strips, Walker is credited with shifting daily comics from serial adventures to stand-alone gags, just as he had done at Hallmark. Walker also experimented with at least eight other strips, but none succeeded as well as those two. By 1990, even the Pentagon came around, awarding Walker a Certificate of Appreciation for Patriotic Civilian Service. 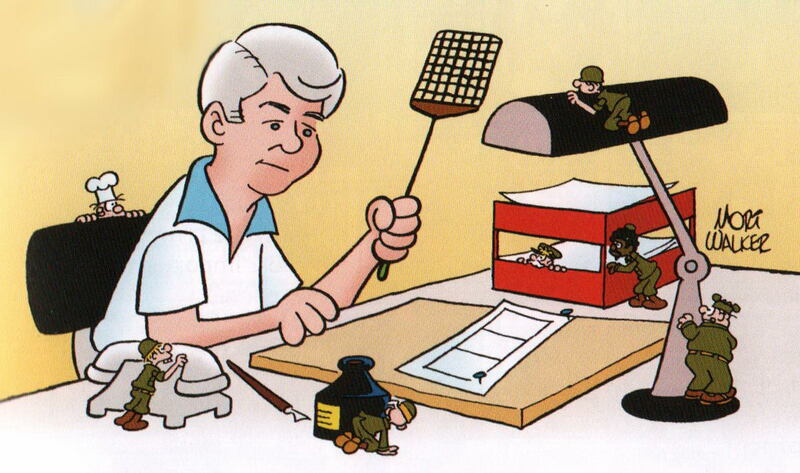 “As hard as it is to find anything at the Pentagon,” Walker said at the time, “they finally found a sense of humor.” Beetle Bailey “gives expression to our resentment by ridiculing traditional authority figures and by demonstrating, with Beetle, how to survive through the diligent application of sheer lethargy and studied indifference,” says comics historian R.C. Harvey. With Walker’s death — on January 27, from pneumonia, at 94 — Beetle Bailey will continue to be drawn by Walker’s sons, Brian and Greg. Hi and Lois is still being written by Brian and Greg, and illustrated by the late Dik Browne’s son, Robert. Both strips are still being aided by Mort Walker’s writing: he claimed before his death that he had 80,000 unused gags in storage.